After having driven several times on the Buddh International Circuit, we always wanted to drive the Jaguars around the track. Finally our request was fulfilled, as we got an opportunity to take these cars on the track. To ensure we make most of the cars, Jaguar had organised a Track Day with three sessions, Driving Dynamics, Hot Laps and Driving Laps. The first session was to understand the driving dynamics of the Jaguar. We drove it around cones to understand the manoeuvrability and braking. This was followed by a set of Hot Laps with a one of the trained driver. We were fluky to get these laps with Narain Karthekiyan. Finally, it was our turn to get behind the steering wheel. We drove the XF S and the XJ L. However, we were unlucky to miss out on the most powerful production Jaguar, the XKR-S.
We have always loved the XF S, when we had test-drove it. We wanted to get this saloon on the track and Jaguar fulfilled our wish. After some previous driving experiences around the track, we were well versed with most of the bends and the track elevations and banking. This helped to push these cars to their limits. The car we drove, was the XF S— the 3.0-litre TDV6 diesel engine. The XF S has agile handling and was easy to push around bends. Despite being 15kgs lighter than the XJ L, it felt that this oil burner had more alacrity in the XF S. The throttle response was also a tad better. The blind right-hand turn was a lot more fun to drive and on the long straight, we hit speeds in excess of 220km/hr. Track is about having the best lap time and ride is the secondary concern. But the ride was so pliant that it helped us to push to the limit. Also, never did it feel that the XF S was unsteady or nervous on any particular corner or bend. XF S was one of the best cars that we have ever driven around the Turn 10. It is agile and the tyres obey the command given by the steering wheel— precise behaviour!. Our confidence was so high in the XF S, that we even drove it in the comfort suspension mode. Still, there was no sign of nervousness from the suspension even when pushed around corners. XJ L is the flagship model of the British marquee. It is available in India with the long-wheelbase and it looks perfect for top guns. It does feel if tuxedo-wearing aficionados hewed this saloon for their personal use. But that’s not the only thing that the XJ L has been designed for. 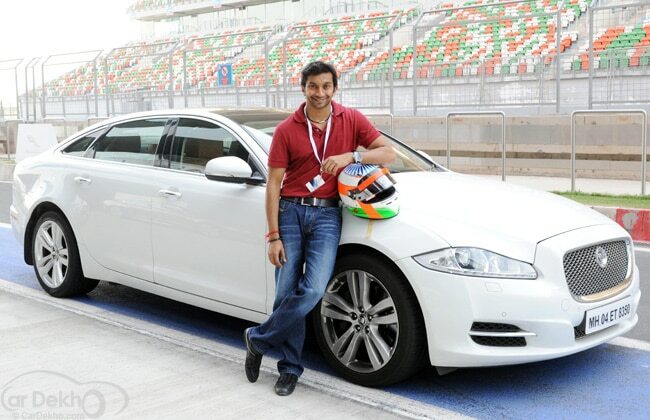 It is equally fun to drive on the track as well, so we take the XJ L on the Buddh International Circuit. The Jaguar XJ L does feel gigantic at turns despite its aluminium construction and being just 15kgs heavier than the XF. The XJ is nimble, but the XF does have an edge in handling thanks to its light steering wheel— which feels a wee bit slack— and also, the 5 metre plus length. It does take sometime to getting used to, and then you enjoy driving the XJ L around the track, push it to its limit and also make it tail happy if you want to around turn 10. Turn the gear knob into S mode and change the suspension set-up to Dynamic mode and you are all good to drive. This improves the throttle response and also the suspension is more adaptive. The transmission also doesn’t upshift unless you do it manually, else it will redline and stick in the same gear ratio. Despite the stiff suspension set-up, the ride isn’t unsettled. This makes driving much more easier than what one would want, and also the ability to push it to the limit is more. The XJ L feels more compact to drive, when compared to its competition. We touched speeds of about 200km/hr in the XJ L on the back straight and the limousine never ran out of steam. Brakes felt a bit soggy, but their bite was progressive. The XJ L isn’t just a car for the back seaters, but also for those who wish to drive. So, the XJ L is an ideal pick for those who are chauffeur-driven in the day and who like to drive at night.